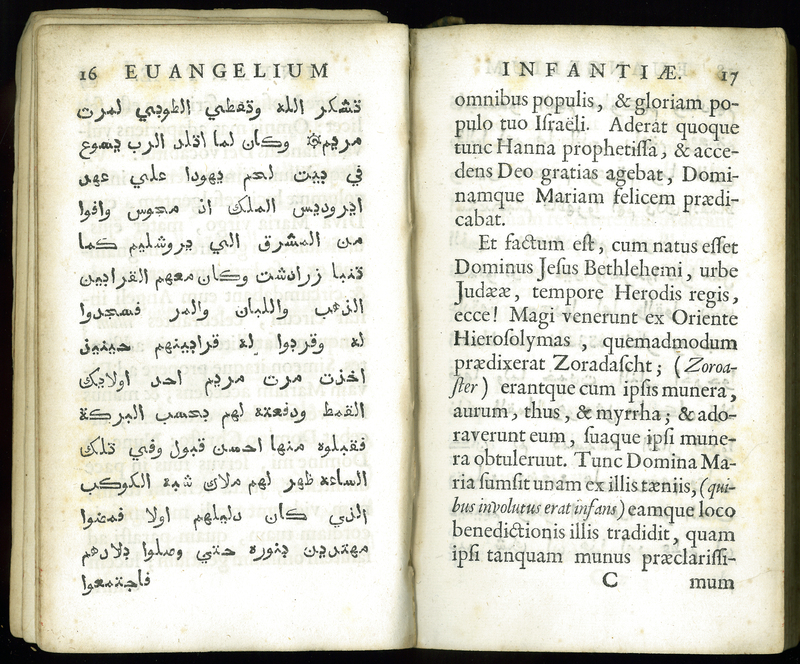 This double-page spread of Arabic-Latin printed text is from an important first edition of the Syriac Infancy Gospel, translated by Henry Sike, Professor of Oriental Languages at Cambridge, in 1697. Also known as the Arabic Infancy Gospel, Evangelium Infantiae concerns the childhood of Jesus. This apocryphal piece, originating from Syriac sources of the 5th and 6th centuries, reveals some amusing claims: a magic diaper that heals people; sweat (of Jesus) that turns into balm, and cures leprosy; and an early encounter for Jesus with Judas Iscariot. ___, “Evangelium Infantiae: Vel Liber Apocryphus de Infantia Servatoris,” ourheritage.ac.nz | OUR Heritage, accessed April 26, 2019, http://ourheritage.ac.nz/items/show/10783.